I have been working on developing a growth mindset culture in my school since October 2013, when I heard John Tomsett speak at TLT13. Over that time I have learned a lot about what works, what doesn’t work, and the stumbling blocks and misconceptions that still persist around growth mindset. 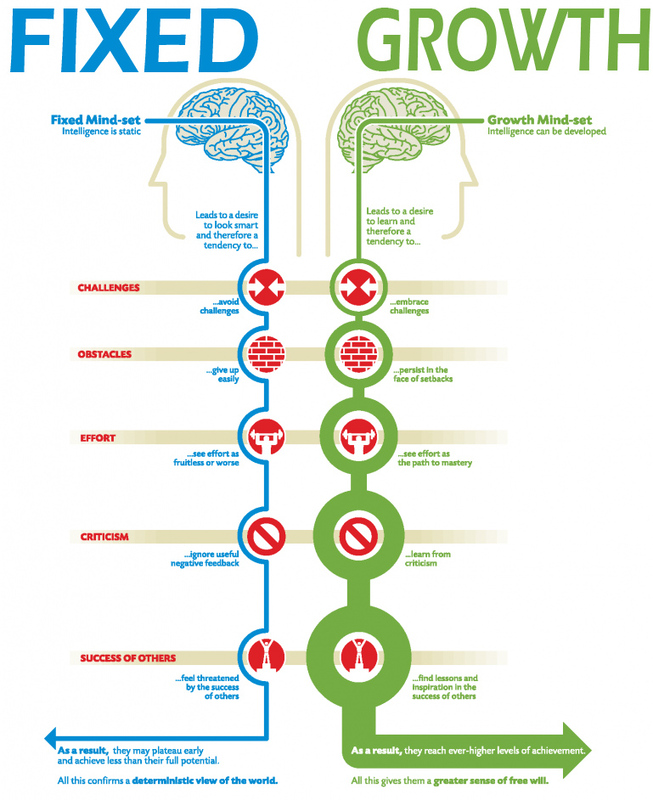 I have also learned a lot more about the growth mindset, and refined my thinking about Dweck’s work. In this post I hope to summarise some of that learning. One thing that’s been happening a lot that I see is that people prematurely conclude that they have a growth mindset. I call it “false growth mindset.” [They say] “oh! Growth mindset equals good? I have it! I’m good! I must have it!” And they haven’t done the work. The fact is, shifting mindsets is about accepting that success is not going to come easy. If we want to be good at something, we’re going to have to work at it. Not just now, but for a long time. Misconception 2: I’ve got a growth mindset: where’s my Nobel Prize? Another common misconception is that a growth mindset will turn you into an Outlier – an exceptional success. This is partly the result of the “famous failures” assembly and, yes, the growth mindset posters which highlight those people who have reached the top of their fields and also demonstrate a growth mindset. The fact is, there are examples of fixed mindset successes – incredible talents who achieve great things on the strength of natural ability and circumstance alone. There are also millions of people who have a growth mindset and are moderately successful. Having a growth mindset does not make you exceptional. As Malcolm Gladwell shows, Outliers are created by a combination of circumstance, system and approach. However – and I firmly believe this to be true – a growth mindset is the best way to ensure you develop the talents that you have and continue to improve. I will never run faster than Usain Bolt – I don’t have the physique. But if I train hard and work at it, I will run faster than I can run now. I am unlikely to paint a masterpiece. But if I go to classes, practice and work at it, my painting will improve. If I don’t believe that I can improve – if I believe that my running or painting ability is fixed – then I won’t work at it and I definitely won’t get any better. I’m sure, in many cases, this is true. In other cases, however, it’s an opt-out from a critical self-examination of practice and an opportunity to improve. I’ve definitely been guilty of fixed-mindset practices in the past: I’ve congratulated students for getting the top mark in the class in their end of year exams, for example. This kind of well-intentioned approach to celebrate achievement encourages students to compare themselves with one another, rather than evaluating their own performance relative to their own progress. To then bemoan the fact that students are only focused on the marks and not on the painstakingly constructed formative feedback is the ultimate irony. Removing grades and marks from work this year and handing it back only with formative feedback has been transformative. We can all get better. But we need to be self-critical, and actually engage with the research. Read Mindset. Listen to Dweck speak. Read her interviews. Read the research. Don’t assume you know what growth mindset is all about until you have. The thing that keeps me up at night is that some educators are turning mindset into the new self-esteem, which is to make kids feel good about any effort they put in, whether they learn or not. But for me the growth mindset is a tool for learning and improvement. It’s not just a vehicle for making children feel good. Failure should feel bad. It should be painful. We should all be motivated to work harder because we want to be successful. We should learn the lessons of failure so we can avoid those mistakes in the future. Effort and hard work are only worth it if they are directed and purposeful, otherwise you ingrain bad technique and habits. Practice piano scales for an hour with poor hand positioning, and you’ll do more harm than good – so it’s no good praising that hour’s practice unless it’s been purposeful and productive. Am I better now than I was before that work? What have I learned? What have I improved? Self Esteem is not something you give to people by telling them about their high intelligence. It is something we equip them to get for themselves, by teaching them to value learning over the appearance of smartness, to relish challenge and effort, and to use errors as routes to mastery. And that is why mindsets matter so much. Mis-step 1: You can’t change someone’s mindset; they have to change it themselves. Y7 in DT today, put down torch she was making, saying "I can't do this!" She glanced at me. "Yet," she sighed, and picked it up again. Me: You’ll need to go through and work on those fonts and re-edit the picture if you want to improve that. Student: Do I have to? Me: It’s the only way you’re going to improve it. Me: Effort is what ignites your ability and turns it into accomplishment, you know. Student: Can’t I just hand it in like this? Needless to say, I didn’t leave it there and the fonts and image were improved. But still, why wasn’t my student convinced? She’d been to my assembly. Surely she should be applying herself to self-improvement with every fibre of her being. Didn’t she realise she was at a Growth Mindset School™? I can create the conditions which make the development of a growth mindset natural, easy, and self-evidently sensible – but teenagers being teenagers, the self-evidently sensible path is not always the path most trodden. I could compel her to improve her work. But I couldn’t compel her to change her mind. She needs to do that for herself. One mis-step I think we made in launching our growth mindset ethos, due in part to the enthusiasm we felt as staff for the project, is that I think we made too much fuss. It was teacher led and this ran the risk of creating a condition which we came to recognise as “growth mindset fatigue” – the tendency of teenagers to groan whenever the term was mentioned. A successful psychological intervention involves a quick, well-targeted ‘nudge’; not repeatedly hitting students over the head with a sledgehammer! What we definitely got right is ensuring that each aspect of the school’s culture and approach is compatible with developing a growth mindset. This approach to adjusting the normative influences within the school is definitely productive. But, in the early days, asking students to reflect weekly on their learning approaches definitely felt more like sledgehammer than nudge, and led to the aforementioned “growth mindset fatigue”. None of this is catastrophic, and easing off the use of the terminology whilst maintaining the shifts in culture, language, feedback and praise kept the project moving forward. And, after all, in a growth mindset we learn from criticism and persist in the face of setbacks! Mis-step 3: Student Leadership – the missing piece? Some teachers who genuinely have a growth mindset aren’t understanding how to apply it properly. They are just telling kids to try hard: which I call nagging, not growth mindset. Or they are just saying ‘hey kids, have a growth mindset’. Anyone can do Maths at high levels if they are given the right teaching and the right messages. Many kids think that you can either do maths or you can’t…[but] we can all develop the brain connections we need. The brain is very flexible, very adaptable…if you need to learn some maths your brain can adapt and learn it. I feel just the same about growth mindset interventions at school. We have achieved a lot already, but we are flexible and adaptable, and we are learning. Thanks so much for taking the time to write the article. It is very informative. A great blog and very passionate too. What are your views on the article by Dr Tim o Brien in the TES? It really changed my views and made me think deeper about the way we apply mindset. I’ve not read that. Do you have a link? Thanks for the comment! Thanks – will look it up! Just checked @doctob. it is a paywall article but but looks like he posted a pic of the opening even tho he’s probably not supposed to. Thanks again for your blog. Lovely , analytical piece of writing. I feel the same issues apply to teaching all-attainment groups which I have written about a lot (see my website). However successful all-attainment teaching is not about merely putting all the learners into mixed groups; ‘it’ is about what learners do; how teachers plan accessible tasks which can be extended and deepened by learners. It is also about teachers knowing the why and the how behind all-attainment grouping. Developing a whole school ethos which encourages discussion and exploration and emphasises both collegiality as well as individuality are key factors of effective learning. Thank you for your article. We will be launching Growth Mindset across the school from September, and having some ideas of the possibilities and pitfalls is extremely helpful. I have a photocopy of Tim O’Brien’s article I could scan and send you. Thank you – I’ve found it! Hi Iam Harini,could you please email it to me as well,have been trying to read it online..My e mail id …learners31@gmail.com.My Twitter handle is@ rinikaran.Thanks in advance. Thanks Chris, very interesting reading. I feel better about our more slowly, slowly approach to growth mindset having read your article, which happened more by accident than design. This is a very analytical blog and a useful contribution to the whole mindset debate. Thank you very much for taking time to craft it. I work in a special school and we thought the Tim O Brien article mentioned above was an absolute gem. One the side of teachers, on the side of all pupils particularly those who are vulnerable and intellectually very different to anything else I had read on mindset. Any thoughts on growth mindset as you’ve outlined it, and the mindset of ‘mastery’ as conceived in the new primary curriculum? I’m not an expert on the primary curriculum but provided “mastery” of one thing is a stepping stone to the next in a continuous improvement model then I think they’re compatible. “Mastery” is helpful as there is an implication of constant deliberate practice in order to achieve it. I just wish there was a less gendered term. It bears some thinking about, as ‘mastery’ is now linked to expectations related to a specific moment in time, i.e. the end of a year. ‘Getting better’ at something is less of an option – a pupil has either attained or not attained. In theory, it could be a continuous improvement, although the continuity is not always easy to spot, but only for those who achieve what is expected at the pace set in the curriculum. Yes, I see your point. There is a danger of the old “C” grade trap from secondary, where middle set students would be taught up to C grade standard and then stop because they’d “made it.” For mastery to make sense the curriculum must be set up so students who demonstrate mastery can move on and up to the next step. However, it is still better than moving them on to the next step before they’ve mastered the previous one, despite the pitfalls. An interesting area – thanks for raising it. Yes – there is that – and there is also the year by year failure to master the content or even ‘meet expectations’. I would imagine it might be difficult to foster a growth mindset under those conditions.